As slimmer, sleeker and more advanced mobiles and tablet devices are being designed, PC sales are slowly declining and have been forecasted to fall a further 7.8 per cent this year by research firm IDC. With most smart phones and tablets allowing users to perform a majority of the actions carried out on PC’s whilst out of a computer setting environment, it is no wonder these devices sales have been estimated to increase 58.7 per cent. 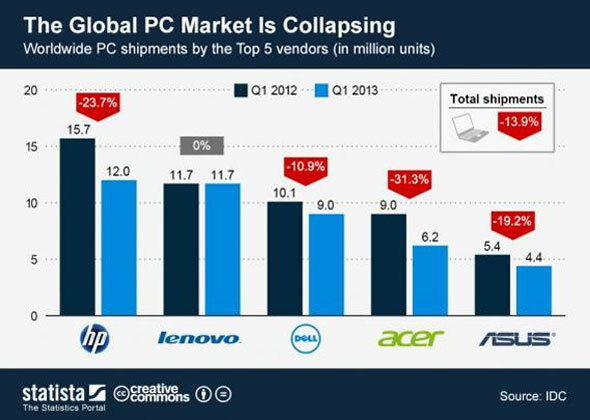 However, IDC did shine some light of improvement for PC sales in 2014.With Windows XP expiry, many companies, schools.